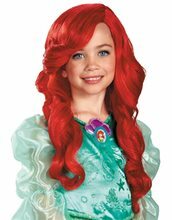 Deluxe Ariel Child Costume.Includes: Deluxe dress and matching hairclip.Available Size: Toddler - XSmall (3T-4T), Child - Small (4-6), Child - Medium (7-8). (See Size Chart For More Information) *Accessories Sold Separately. Girls can live under the sea for a fairytale adventure in our shimmer deluxe Disney Ariel Toddler Costume. Your little mermaid no longer has to wish to be apart of that world! 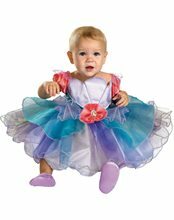 Our Deluxe Shimmer Disney Ariel Mermaid Toddler Costume includes a deluxe lavender and teal dress and a matching hair clip with Ariel cameo. The Ariel Mermaid dress features a shimmering metallic fabric on the center of the bodice, the peplum and the mermaid tail fins with a shimmering fabric flower displaying an Ariel character cameo on the chest. The shimmer deluxe version of the Disney Ariel Costume will have your toddler swimming around the house recreating her favorite scenes from The Little Mermaid as her favorite Disney princess.